How To Get More People Cycling – Every Day! By Laura Schou and Jakob Schiøtt S. Madsen, Danish Cyclists’ Federation. Until today, knowledge about motives, incentives and other factors that make people leave the car at home and choose cycling as their primary choice when getting from A to B, has been sparse. The project therefore gathered information from people who had recently replaced their usual mode of transportation with cycling. According to the respondent’s participating in the study, choosing your bicycle every time the sun is out does not make you a cyclist – at least not a real one. “A real cyclist is someone who uses their bicycle every day and as their primary mode of transportation”. The respondents explained that they did not live up to the criteria about what makes a cyclist and therefore for example still considered themselves drivers. This was especially characteristic for those who had recently tried replacing driving with bicycling – in spite of the fact that 99% of everyone in the Danish population considers themselves cyclists – just not real ones. The study showed that changing transport habits is not always as easy as it seems. It takes time to get used to the thought of cycling every day and many habits and ways of going about are going to have to change. This affects your daily life – your morning routines change, your time schedule changes. Actually, the rest of your day can become quite different from what you have been used to. Something that comes with challenges which are not always comfortable. When starting out cycling it seems as if there are often more disadvantages than advantages. And during the process there will be challenges, personal victories and gains – all of which are important in creating new transport habits. This is considered a maturity process. What Will Make More People Cycle? The above-mentioned focuses more on intrinsic factors than external factors. But other aspects must be taken in to consideration. First of all the infrastructure for cycling has to be good and attractive. In big Danish cities many municipalities are a step ahead in the development of proper cycling infrastructure. But the smaller municipalities are having trouble on the bicycle front and are falling behind. They are challenged by longer distances and fewer cyclists. 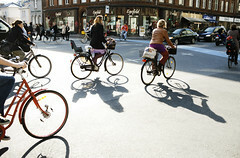 It is difficult to describe a general Danish cyclist, as they vary in age and lifestyle. But the bicycles do fulfill the same function across different characteristics; as mode of transport or exercise. In the different phases of life, we do have at least one scarce resource – e.g. time – that we seek. This fact does offer both barriers and motivation for the change in transport habit. The study has embodied four quantitative analysis with approx. 25.000 respondents overall and two sets of qualitative analysis with around 60 interviews. The analysis was conducted by IS IT A BIRD, member of the Cycling Embassy of Denmark. Download the full report in English. The translation is made possible by SRAM Cycling Fund and People for Bikes.